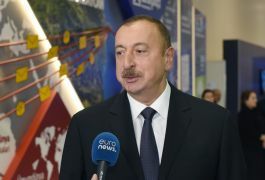 President of the Republic of Azerbaijan Ilham Aliyev has responded to questions from Euronews and Russia-24 channels as he viewed BakuTel-2016, the 22nd Azerbaijan International Exhibition and Conference on Telecommunications and Information Technologies. The head of state highlighted work carried out in Azerbaijan amid the fall in oil prices and the projects implemented to reduce dependence on oil and gas. President Ilham Aliyev provided an insight into what has been done by Azerbaijan to tackle global cyber security challenges, and also underlined the importance of Bakutel 2016 exhibition.